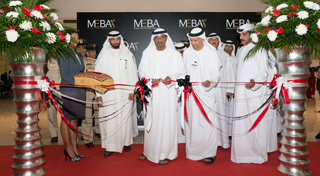 The MEBAA Show takes place at the purpose built Airshow Site at DWC, Dubai. The venue is easily accessible from Sheikh Zayed Road, Mohammed bin Zayed Road, and Emirates Road. 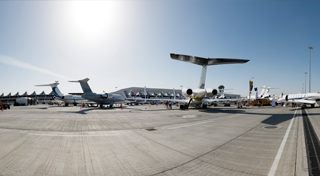 The purpose built MEBAA Show venue at DWC features ample parking, one huge exhibition hall and a large static display. Please contact our Official Accommodation and Travel Partner, RW Events. Taxis are very affordable in Dubai and are available from your hotel or can be hailed on the road. Please note that demand for taxis in Dubai can be high and at peak times such as the end of the show there can be a long wait for taxis. We do our best to get as many taxis on site as possible but taxi supply is unfortunately beyond our control. Exhibitors can order parking passes through the Exhibitor Ordering System (EOS); there is also ample free visitor parking. This year Ibn Battuta Metro station is closed due to construction. There will be no shuttle buses running to and from this station. Instead, there will be a shuttle bus running regularly between the Address Dubai Marina Hotel and the MEBAA Show, between the hours of 07:30 and 19:30. 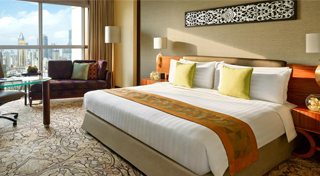 Shuttle Buses will also run to and from a number of main hotels in Dubai. It is worth noting that even if your hotel is not listed on the route map you can get off at a hotel stop near you and pick up a taxi from there. View the Shuttle Buses timetable.